Solemn promulgation of the constitutional amendment concerning five subjects (Law Gazette nrs. 101, 102, 103, 104 en 105) and the announcement of these amendments in several places in the Netherlands. SHOTS: - the promulagtion of the constitutional amendment in an open meeting, chaired by the president of the Supreme Court of the Netherlands, esquire mr. R.H. Feith. The promulgation of the amendment is done by the acting Procurator-General mr. W.J. Berger, after which the clerk mr. H.J. 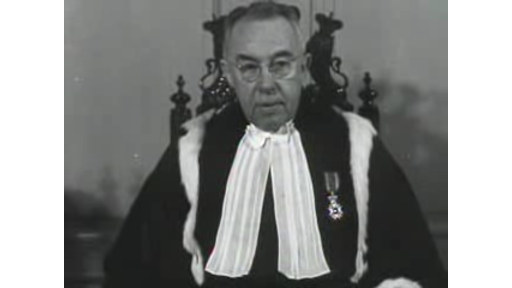 Kist reads the amendment aloud; - several city shots of Amsterdam, Rotterdam, Marken and Hemmen and the announcement of the constitutional amendment in Amsterdam by secretary S.J. van Lier and mayor W. de Vlugt, secretary Smeding in Rotterdam, and mayor of Marken dhr. Verheul and the mayor of Hemmen (municipality Valburg) dhr. den Hartog. Note: City name of title list Polygoon: "Heumen" (in stead of "Hemmen"). From the footage of Amsterdam onwards, there is no sound.